After a few months with no Scottish polling, today’s Sunday Times carries the results of a Panelbase one which, among other things, reinforces our oft-stated view that Scottish subsamples of UK-wide polls are completely meaningless. 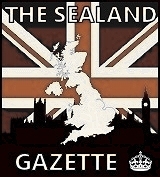 While several of those have shown Labour or even the Tories in the lead, the full-size, properly-weighted poll still has the SNP a massive 14 points in front on 42%, with the Tories trailing behind on 28% and Labour in their now-customary third place at 22%. Support for independence is also slightly down, with the numbers at 43-57, but it’s some other findings that are the eye-openers. Fear and lies work. 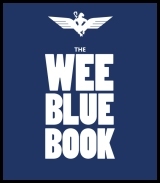 Over many decades (and really for centuries) the Unionist parties and the media have succeeded in persuading a large percentage of Scots that they’re beggars, scroungers, vagrants and “subsidy junkies” dependent on the ever-generous charity of England to keep them from starvation. And in terms of the facts, that hasn’t always been an easy sell. Jeez, Ken, Valentine’s was a fortnight ago, you had your chance. 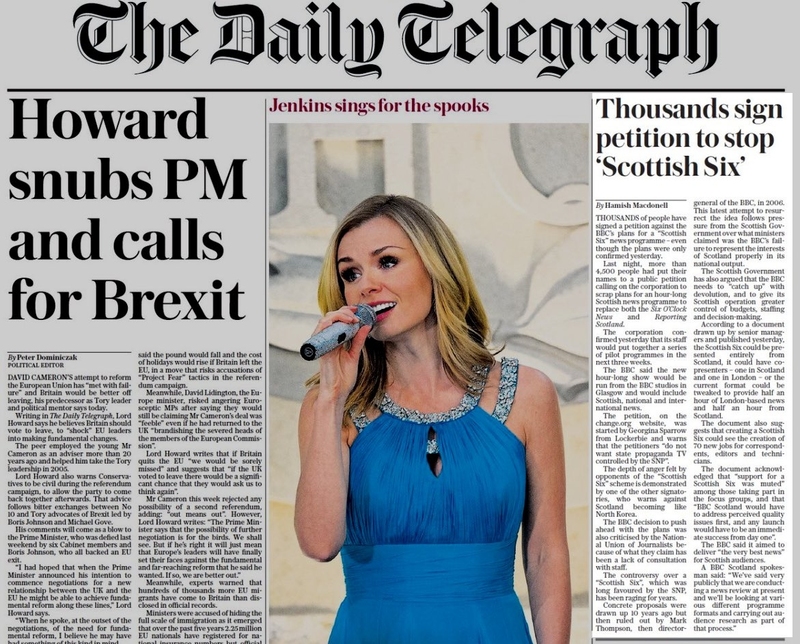 In what may be a new all-time low for the broadsheet press in Scotland, this morning’s Scottish edition of the Telegraph makes a front-page lead story out of a petition with a pathetic 4500 signatures, put together by some extremist Yoon nutters to express their rage that there might be a peak-time news show actually made in Scotland. 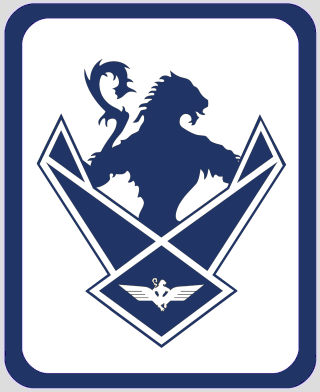 The idea of a so-called “Scottish Six”, whereby the main six o’clock news bulletin would be a single programme made by BBC Scotland and covering Scottish, UK and world news – rather than the current half-hour London-centric UK programme followed by 30 minutes of regional murdur’n’fitba in Reporting Scotland – has been exercising the media (and pretty much nobody else) for the best part of 20 years. But now it’s become a constitutional battleground, and the funny thing about it is that the two sides are fighting bitterly over something neither of them actually really wants. That’s okay, Chris. 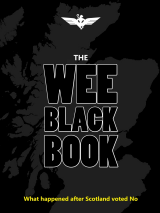 We’re embarrassed that you’re Scottish too. From this interesting documentary last month on Al Jazeera. This is how they think they’ll win. 49 days left to prove them wrong. 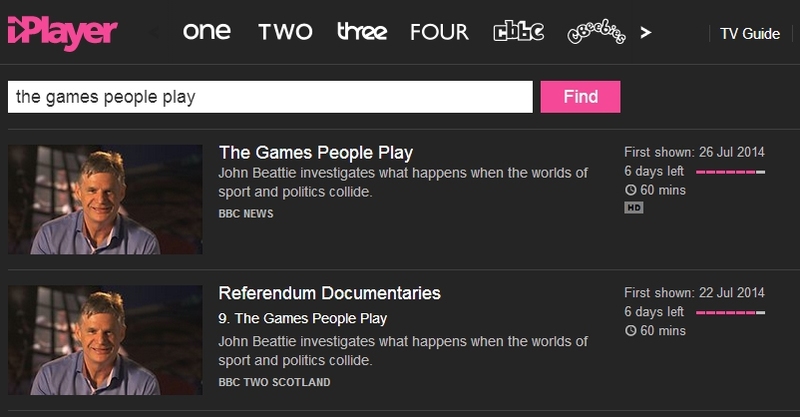 We just caught a documentary on the BBC News channel presented by John Beattie and entitled “The Games People Play”, which seems to have been first aired on either Saturday or Tuesday (the BBC seems somewhat uncertain). Covering the link between sport and politics, for our money it’s one of the best things the state broadcaster has produced as part of its referendum programming, and we recommend it. One rather depressing bit leapt out at us, though. Sir Craig Reedie CBE, from Stirling, is former chairman of the British Olympic Committee and a current member of the International Olympic Committee. 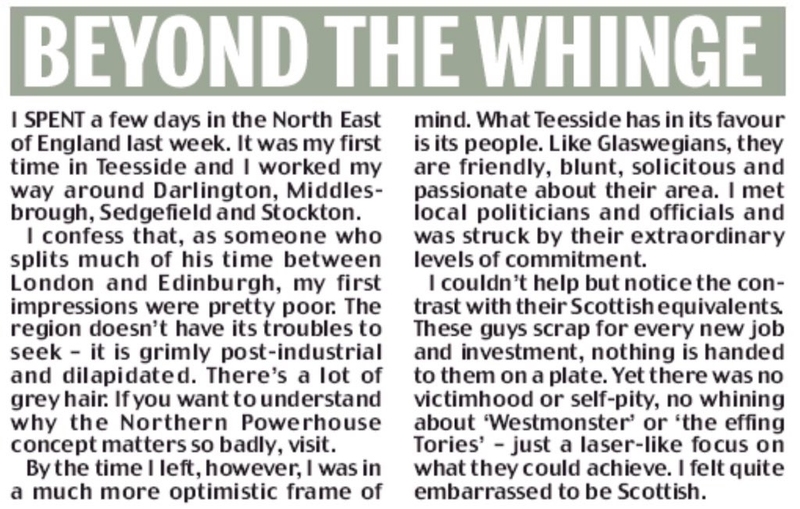 And when Beattie asked him about an independent Scotland’s entry into the 2016 Olympics in Rio, he gave an answer which readers may or may not find surprising, depending on their level of cynicism about “proud Scots”. And this time we’re not being sarcastic. 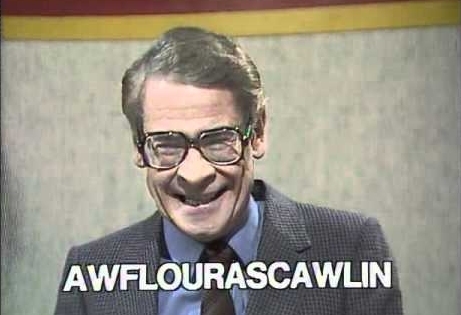 We were bemused yesterday when a number of people on Twitter started swapping referendum-based jokes about Stanley Baxter, who for younger readers used to be some sort of pantomime star and vaudeville performer. The jokes were explained today when it was revealed, to our considerable surprise, that Mr Baxter was in fact still alive and urging a No vote in the referendum. Baxter, who left Scotland 55 years ago and told the Times that he now returns only for “the odd funeral”, nevertheless felt able to assert from these occasional visits that support for a Yes vote was founded in hatred for the English from simple-witted Scots who “don’t know any better” caused by “Braveheart” and hey, stay awake at the back there because we’re coming to the important bit. 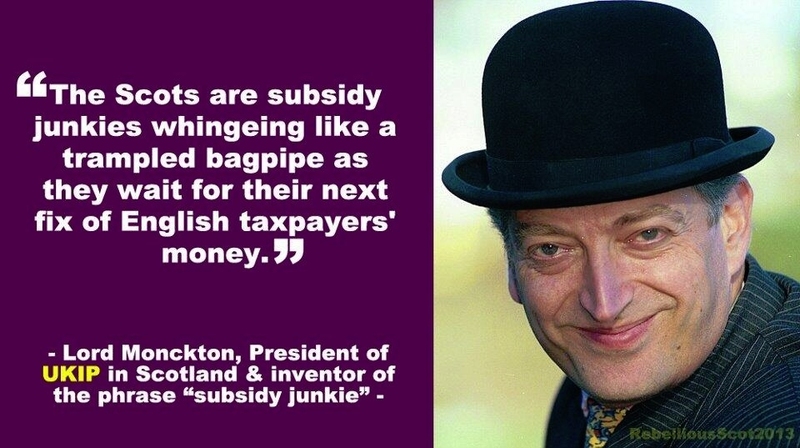 And that’s that the comedian, who made a career out of telling TV viewers that the people of Glasgow had hilarious incomprehensible accents in need of translating into proper English, also went on to (no doubt impeccably) articulate the real reason, never previously spoken aloud, that the No campaign wants Scotland to stay part of the UK. 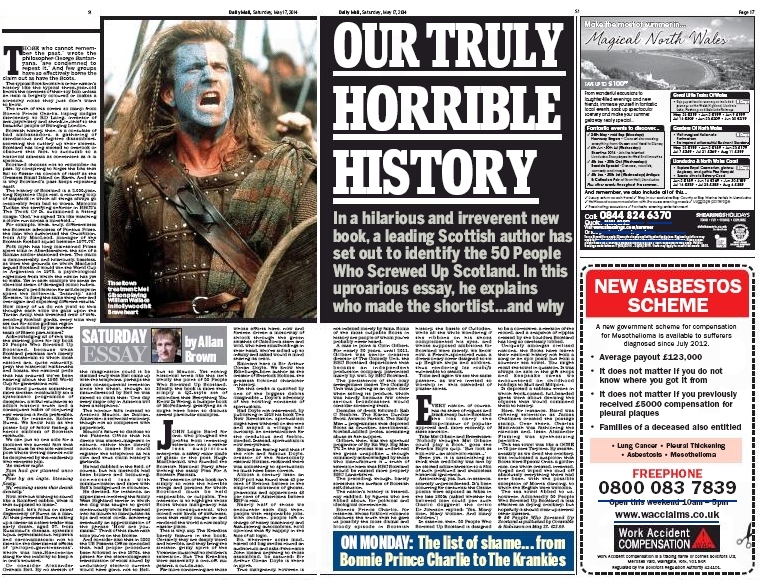 This one, from today’s Scottish Daily Mail, might actually be beyond comment.